The answer to the question is yes. According to the Mayo Clinic, hoarding disorder is “a persistent difficulty discarding or parting with possessions because of a perceived need to save them.” Those who hoard have difficulty parting with possessions even if those possessions are of little or no value. This behavior can affect the emotional, physical, social and financial status of the individual and their family. Commonly hoarded items may be house hold items, newspapers, magazines, paper or plastic bags, boxes, photos, food or clothing. 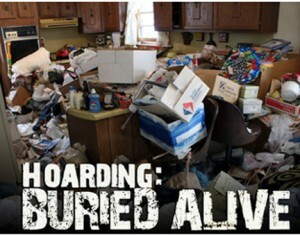 Hoarding is a disorder that may exist on its own or in conjunction with other health disorders. Obsessive compulsive disorder, obsessive compulsive personality, disorder attention deficit disorder and depression are often linked with hoarding. There is often a feeling of shame and embarrassment associated with hoarding. Symptoms include: Significant anxiety when attempting to discard items. Obtaining and saving large amounts of items. Difficulty to organize items with items overtaking rooms of the home. Indecision about what items should be kept and what items should be discarded. Mental and emotional distress or overwhelm regarding the amount of items in the home. Fear of running out of an item and not having that item on hand in the future. Loss of living space, social isolation, family discord, health and safety hazards. Why do people hoard? It is not exactly clear what causes hoarding disorder. Perhaps genetics or parental influences or certain patterns in the brain. Stress may have an influence as well as emotional distress from loss of a loved one or pet. Other reasons include the belief that items are special or hold more monetary value then is realistic. Some are paralyzed at the thought of throwing items away for fear they are “wasting”. Certain items hold emotional value or serve as a reminder of the good days gone by. And some feel a sense of safety when surrounded by all the items that make up their hoard. If you suspect you or a loved one have a problem with hoarding, it is best to seek professional help. Look for a therapist who specializes in hoarding situations. In some cases, an intervention is needed to ensure the safety of children or the elderly. After seeking the help of a therapist, a professional organizer is a great asset and can assist in collaboration with family members and other professionals to help guide the client to a more fulfilling and safer way of living. 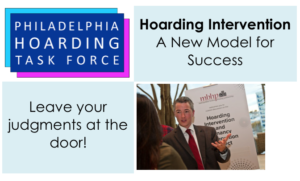 The Philadelphia Hoarding Task Force, a coalition seeking to improve the outcomes surrounding hoarding issues, hosted a hoarding intervention workshop led by Jesse Edsell-Vetter. Jesse presented an innovative intervention model that he has developed and implemented with an impressive 98% success rate. The key to his model is the shift of focus from the “stuff” to the person. In the past, Jesse, a Case Management Specialist with the Metropolitan Boston Housing Partnership, had used a common approach when dealing with hoarded homes. He would explain the health and safety issues and cite the code violations that had to be resolved to prevent eviction. After leaving the person alone to address these issues, follow-up meetings predictably showed little-to-no progress. A clean-out was the inevitable next step, costing an average of $10,000. Over time, Jesse observed the homes return to their hoarded state. Focusing solely on the clutter has proven to be extremely costly and unsustainable as a treatment option. Beyond the monetary cost, the emotional trauma is also a factor. In one tragic example, a family returned to their home after the clean-out and committed suicide. In response, Jesse shifted his approach from focusing on the “stuff” to focusing on the person: who they are, their commitments, their struggles and what moves them. For the majority of us, life’s challenges leave scars and hurts that dissipate with time. For people with hoarding behavior, woven in the items they hoard are their scars on display for all to see and judge. While a clean-out removes the “stuff,” it does nothing to unlock the stories and hurts interwoven in the piles. Jesse’s model, in contrast, coaxes these stories out with respectful, compassionate and nonjudgmental interactions emphasizing the human side of the clutter, lessening the grip of extreme hoarding habits. During the workshop, Jesse shared a case study about Bob, an elderly man challenged with health problems, living alone, facing eviction, and surrounded by paper piles, some as high as seven feet tall. Rather than mandate compliance to codes and leave Bob alone to manage his stuff, Jesse explained the safety requirements to Bob and asked how he could help. 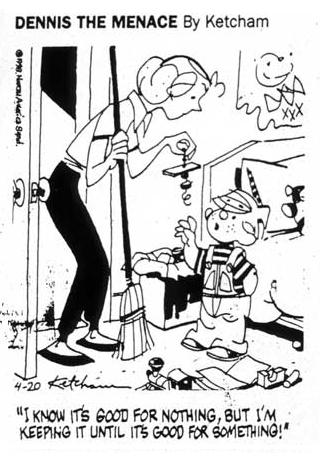 Jesse gained Bob’s trust with empathic statements like, “I worry that X” and “I am concerned because Y.” As Jesse rolled up his sleeves and sorted through the piles with Bob, he asked questions such as, “Tell me about your X” or “Tell me about these papers I see.” This technique of “curious questioning” revealed Bob’s vulnerabilities (mental and physical health, traumas, and family history), his cognitive processes (problem solving, attention, and executive functioning skills) and his core beliefs (values, responsibilities, and how he sees his place in the world). Jesse learned that Bob came from a very religious family. Three of his sisters were nuns, and he himself had wanted to be a priest. Struggling with his sexuality, at age 20 Bob told his family he was gay. He was then shunned by his family and his religious community. Fast forward from that time in the early 1960’s to the present day, Bob’s apartment was a manifestation of that devastating loss. One item Bob hoarded was church bulletins. He attended church services every day, each day taking copies of the bulletin with the intention of sharing them with others. From the overwhelming piles, it was obvious though that this rarely happened. Using a team approach, a cornerstone of his intervention model, Jesse invited Bob’s priest to collaborate. Seeing how committed Bob was to his religion, the priest asked Bob to assist him in providing communion to people who were unable to attend church. In that moment, Bob recovered his purpose in life and adopted a healthier expression of his deep connection to his church and community. Bob’s story illustrates the human side of Jesse’s 98% success rate, showing what’s possible when we leave our judgments at the door, stop addressing the person’s “stuff” and instead, unlock the stories and hurts buried in the hoarded piles. When intervention models lead with the threat of a clean out, walls go up, but, as Jesse has shown, when the intervention is infused with respect, non-judgment, curious questioning, statements of concern, clearly articulated expectations and actions, motivation and genuine praises for milestones met, partnership and collaboration becomes possible and the work of letting go and healing begins. In Bob’s case, when the priest invited Bob to help him, Bob was able to connect to his life again and the importance of his “stuff” could take a back seat. Philadelphia Hoarding Task Force – In Its Second Year & Making Headway! As a follow-up to my blog post from last year at this time, I am thrilled to report that the Philadelphia Hoarding Task Force (PHTF) is in its second year and making headway. An ambitious undertaking to say the least! 1. Resource Guide – This guide offers immediate and non-immediate resources that may help a person with hoarding behaviors live a safer, healthier life. It can also be used by organizations that have clients who have hoarding behaviors. Please click the link for further details Resource Guide. 2. Helplines – Assist those with questions regarding hoarding-related issues in the Philadelphia area. This workshop is presented by one of PHTF’s Education Committee members and is offered free of charge to the public. These workshops are listed on the website. Arrangements can be made to have an “Introduction to Hoarding Workshop” done for a specific group or organization that serves the Philadelphia community. Email PHTF at info@philadelphiahoarding.org. Increase Community Outreach – by introducing individuals and agencies to the task force (website; flyers; etc). Increase Training Opportunities – by educating people about hoarding behavior and interventions. Expand Resources – by coordinating and bringing new interventions to Philadelphia. Applying for the Bader Foundation Grant to make Philadelphia a Hoarding Case Management replication site with technical assistance from the Metropolitan Boston Housing Partnership, a program that has shown much success with those with hoarding behavior. A statistic listed on the PHTF website notes that individuals with hoarding behaviors account for two to five percent of the population—an estimated 23,600 to 59,000 adults in Philadelphia. These numbers are alarming and reveal the need to address this issue individually and as a community. 1. To focus on the person, not the problem or the items they hoard. At the heart of their work is an awareness that behind every hoarded home is a person who needs help, not judgment. They require patience and respect from everyone involved. 2. Since there can be serious consequences for people who hoard because hoarding can be a serious hazard, PHTF advocates solutions that will help resolve emergency issues while also providing support over time. 3. PHTF seeks a balance between the rights of the individual to live as they choose with the needs of the community. 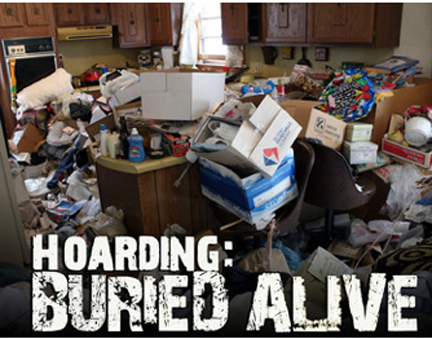 PHTF believes that hoarding goes from being an individual struggle to a community problem when it threatens health, safety and livability for those living in a hoarded home, their neighbors, and also the service providers, contractors, and emergency responders entering a hoarded home. In short, PHTF works to provide individuals and organizations in the region with the tools they need to successfully overcome the challenges associated with hoarding behavior and the public safety hazards that may result. May the ‘Force’ be with the Philadelphia Hoarding Task Force again this year as it continues to make headway through these uncharted waters! Along with four other Professional Organizers, I had the opportunity to attend a meeting of the Philadelphia Hoarding Task Force and was excited to find out that we are NOT ALONE! The result of hoarding behaviors touches countless lives. The most obvious is the lives of those with hoarding habits, those who live with them, their children, family members, and close friends. Maybe, less obvious, is the effect of this life style on their surrounding communities. Often times there have been multiple attempts to deal with and support those with hoarding habits resulting in little change and outcomes that don’t last long. Interventions usually focus on having the person divest themselves of things that clutter their living spaces. Frustration, hard feelings are the typical results as little seems to penetrate the multifaceted web of commingled issues, emotions and unrelenting habits that have, more likely than not, spanned the individual’s life time. This particular and persistent practice of collecting is the manifestation of a complex network of interpretations for the person who engages in hoarding behaviors. For many who are observing these hoarding tendencies, it is virtually impossible to understand, decipher, and make sense of the complexities involved in the condition. Working side by side with clients who engage in hoarding behaviors, I have heard very elaborate and creative explanations for their holding on to what looks like, to anyone else, seemingly useless items. Their ‘need’ to save things is logical in their view, however, the result of their logic is counterproductive to their desire to alleviate their situation that impacts themselves, their loved ones, and in some cases, their community. Because the result of hoarding behaviors looks like disorganization and clutter, at first glance, it would seem like working with hoarding situations is perfectly suited for the organizing profession. Initially, that was the thinking of the pioneers of our profession until they began to notice that successful organizing methodologies, principles, and products did not seem to work with certain clients. During those early years, organizers tried to impact situations where shower rods became alternate hanging spaces for clothes, dining room tables became storage for piles of papers often flowing over to the accompanying chairs, and beds housed everything else leaving little to no room for the owner. The result, a sub group of NAPO was birthed. Back then it was called NSGCD (The National Study Group on Chronic Disorganization). Today, it is its own independent organization called The Institute for Challenging Disorganization (www.ChallengingDisorganization.org). Their mission is to provide education, research, and strategies to benefit people challenged by chronic disorganization. Working with these situations for the past 11 years as well as being a member of NAPO and ICD, I have learned that simply talking about the ‘stuff’ with clients is limiting and often times futile. Getting to the reasons and explanations for their need to hold on to items helps to unlock the interpretation that justifies their hoarding behaviors and often times can loosen the grip of their ‘need’ to hold on to things. However, delving into the root cause of these tendencies is outside an organizer’s skill set and training. Teaming up with other professionals such as social workers and therapists, offers more hope for longer-lasting results. Finding these opportunities to team up with other professionals working with people challenged with chronic disorganization has not been easy until recently when the Greater Philadelphia Chapter of NAPO (NAPO-GPC) was contacted and invited to participate on the Philadelphia Hoarding Task Force. An impressive list of local organizers accepted the invitation, and it was love at first meeting! Finally, we are NOT ALONE in our work with these clients! Still in its infancy, the mission of the Philadelphia Hoarding Task Force, co-chaired by David Wengert from the Community Legal Services and Katherine Martin, Deputy Policy Director from the Mayor’s office, is to “ensure positive outcomes for those individuals who are impacted by hoarding.” Although the Task Force does not provide direct services, its role is to ensure access to resources, training for provider organizations, and education about hoarding in Greater Philadelphia”. The meeting that I attended with four of my collogues was comprised of representatives from the Philadelphia Police and Fire Department, Licenses & Inspections, Philadelphia Corporation for Aging, and Clutterers Anonymous, to name a few. Each of the representatives brought their unique perspective to the meeting. The shared conclusions was that the work of the Task Force should focus on the individual, not the problem, i.e. the ‘stuff’ and that this perspective should permeate all efforts made by the Task Force, especially in the educational trainings it provides. A shared understanding of the complexity that leads to hoarding behaviors among the organizations that confront these circumstances, along with sharing resources, expertise, accountabilities, and services, was music to all of our ears! Finally, we as organizers, can say, we are NOT ALONE in our work with clients who are struggling with habits of hoarding! Collaborating with other professionals helps us offer those challenged by hoarding habits a more holistic service approach, and a hopeful future. As professional organizer I hear people label themselves especially when they call for help. Usually this occurs while doing an assessment on the phone. Often, the person calling states or describes themselves as a hoarder. My opinion is that, due to reality shows like Hoarders or Buried Alive, people seem to identify themselves from what they see on t.v. People use this label even when they aren’t a hoarder. It’s become a generic label that people use falsely to describe themselves. These days, what you see or hear in the media soon become buzz words used by many. In times prior to reality shows these people may have called themselves pack-rats. They may be defined as people who gather, accumulate, store quantities of items for too long — for many “meaningful” reasons. Generally, hoarding behaviors fall under the category of chronic disorganization. With my 10 years of “hands on” experience and educational classes on chronic disorganization, my definition of hoarding is this: Hoarders are people who are emotionally attached to their things and gather excessively beyond the norm. This includes trash as defined as items soiled, damaged, expired, unhealthy, worthless, or nonsensical. They place a higher value on these items and sometimes have irrational reasons why they hold on to them. They will acquire and put themselves in harms way in order to keep these items in their physical space. They will choose to give up all support and interaction with other human beings. What they acquire and choose to keep — become and are — their prized possessions. They will jeopardize their own safety in order to keep these possessions. They can live in filth and squalor. They endanger themselves and the dwelling’s structure and home’s safety. In extreme cases they will become homeless in order to hold onto their prized accumulations. Hoarding is a clinical term now recognized by the American Psychological Association and is included in their Diagnostic and Statistical Manual (DSM). In the current edition, DSM-V, this disorder, Hoarding is newly defined. After so many years, hoarding is now being studied, researched, and evaluated individually. It also can coexist with several mental disorders and diseases. Professional Organizers ask pertinent questions when doing an assessment so we can best serve the individuals. We do not judge people, and quite often find people use the “hoarding” term too broadly and too often.This is so sad, CLUTTER will make anyone feel unhappy. Labeling yourself can be self defeating. Labels can help identify and create awareness for change. But labeling yourself as a hoarder can ultimately give you a negative self image. It will dis-empower you; its negative connotations will not forward your growth or the process. Support is important, especially if you feel like your living space is out of control. Please get assistance either from a healthcare professional, your physician, a professional organizer specializing in chronic disorganization, or from all 3 sources. The key is awareness, getting help, and taking action! “Chronic disorganization is having a past history of disorganization in which self-help efforts to change have failed, an undermining of current quality of life due to disorganization, and the expectation of future disorganization.